Spotted on a recent stroll up Carroll Street towards Third Avenue – the Graffiti-Free NYC truck removing spray-painted scribblings from a residential building. 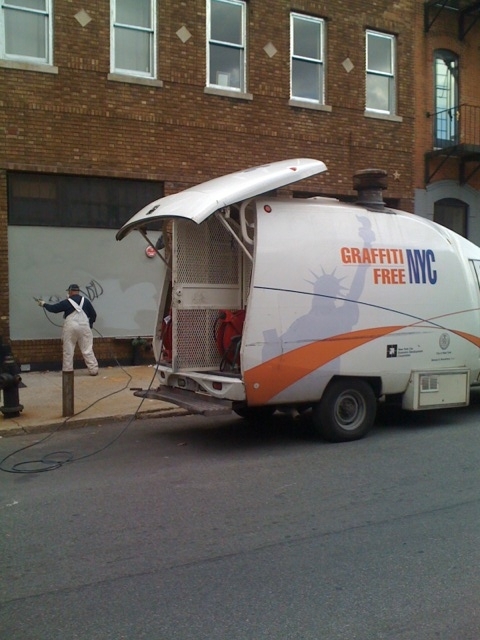 I had never seen the truck in the neighborhood and I certainly wasn’t aware of the City’s Graffiti Free NYC Program, which offers free graffiti removal to properties throughout the five boroughs. If you want a graffiti-busting van to come cleanup your site, you can call 311 or fill out a Forever Graffiti Free form. Typically, a cleaning crew will show up within about 35 days after the City is notified there’s a problem, and either repaint or power wash away the graffiti. If you want to do it yourself, Mayor Michael Bloomberg’s Paint Program will provide supplies and paints for community-based and volunteer groups to plan and execute their own cleanup projects. I’ve written before how much I like topical or artistic graffiti but sadly much of it polluting local walls is just juvenile vandalism, and for that ilk there’s Graffiti Free NYC.